In a previous post, I wrote about “Security Scanning SharePoint Framework” components. This post is a continuance of this. Everything for the SharePoint Framework project is then downloaded and added to the modules folder. This process is called “scaffolding.” At the end of the “scaffolding” process, a message identifying any missing dependencies and security vulnerabilities displays. It also displays a message to execute “npm audit fix” to resolve them. 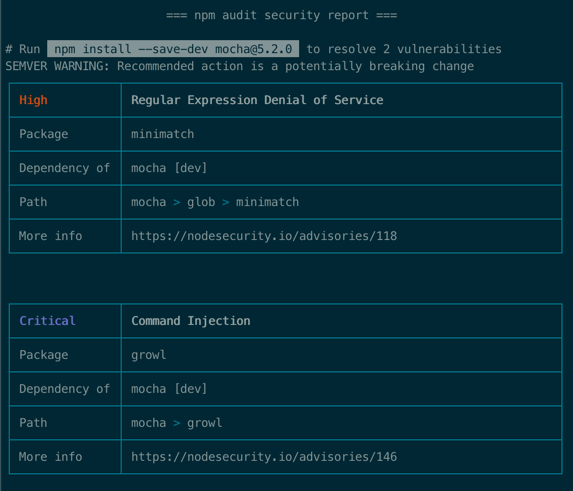 How does NPM identify a potential Security Vulnerability? During this “scaffolding” process, components retrieved and added to the project are checked against the current list of known vulnerabilities. NPM Audit automatically runs each time you install a package using NPM. You can also run NPM Audit manually on any locally installed packages, which will conduct a security audit for the specified package. The output of the command provides a report of dependency vulnerabilities and, if available, suggested patches. The report should now be displayed with the specifics of the vulnerabilities explained. Here is the complication, the issue within a specific library may not be from within the library you are scanning. For example, the “parsejson” library has a “High” and “Critical” issues that come from other dependencies. The problem then becomes how do you fix it, when the actual issue could be within dependencies of a dependency or even further. Can the Vulnerabilities be resolved? If you do not want to fix the vulnerability or update the dependent package yourself, you can open an issue in the package or dependent package issue tracker. Most of the time, security items like this, don’t factor into a typical development cycle. Personally, they should, and it needs to be a change you make as soon as possible. However, I am not naive to think that in reality when deadlines are important that “NOT” having to do this would be better. If you wanted to, you could disable the NPM Audit checks, so you would never see any messages, similar to the way SharePoint Administrators delete all the Health Analyzer issues, so there is no red bar to see in Central Administration. The next question is really “Should you implement the quick fix?” or “Should I ignore the alerts?“. That is a question only you can answer, and determining the answer comes down to how security conscious you are and want to be. For me, I like to know that my code is secure and that any dependencies are vulnerable free as well. If that is what you are looking for too, then taking the time to resolve every dependency may be the right approach. However, a more significant issue here is with the SharePoint Framework components, REQUIRING specific versions within the dependency chain, leaving you out of the picture. It is a hard one to answer, yes you should, no you shouldn’t and then well you can’t as it breaks it all. For the SharePoint Framework components, then you don’t have any choice. However, for libraries that you include, then check them, check them and recheck them. If referencing them from a Content Delivery Network (CDN) make sure they are from the correct source. Also, check them to make sure they contain the actual code you are expecting. Nothing would be worse than including an incorrect reference or library that is then modified by a malicious actor leading to your application code executing tasks it was not originally designed to do, or leaking data outside its boundaries. This is where automated tools can really help. Adding these tools to your development lifecycle can remove the burden from you the developer to an automatic system that validates all references and even code before builds are created. This ensures that potential issues like this are captured and mitigated before the solution is deployed into a production environment. Whether created by the development team or business users, applications are often the root cause of poor SharePoint health. Run the free Rencore SharePoint Applications Health Check App on-premises or online to find issues in your SharePoint applications. For more information and how to download, click the button below.